When it comes to choosing an eductor for the application, Jacobs Process Analytics offers several ‘types’, made in materials that fit your application. Please consult the chart and the following descriptive guide. *Use a liquid to educt a gas sample. However, using a gas motive source to educt a liquid is strongly discouraged. A large fraction of analyzer installations are required to deliver only 1 LPM sample flow through the sample transfer lines and analyzers. 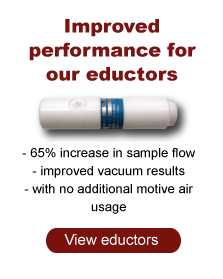 When the exhaust is vented to atmospheric pressure, the best solution is the Micro-Flo mini-eductor. 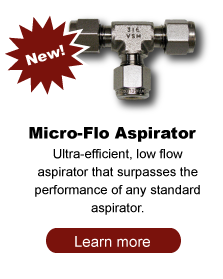 This device delivers the desired flow rate while minimizing the use of air. At 10 psig motive pressure the MicroFlo delivers 1 slpm sample gas while using less than 1 slpm air. Fluctuations in air pressure have a minimum effect on sample flow. Under controlled conditions low flow dilutions are easily reproducible. For gas applications that require a greater sample flow rate, the Motiv-Air-Torr (ASP-520-x-x) is the device of choice. Higher flow rates and higher vacuums are produced by our ‘standard’ eductor. This unit is used for a wide variety of applications from industrial to medical and is the most widely used model. Like all of our eductors flow rate is controlled by motive pressure. When lower flow rates are required, lower air pressure is used, reducing the amount of services used. 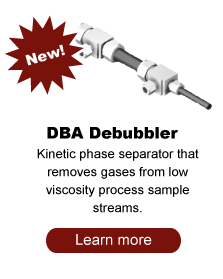 Finer control of sample flow is achieved by using a needle valve and rotometer. For those gas phase applications that have a sample disposal or return-to-process at an elevated pressure, the motive pressure must be increased to compensate. 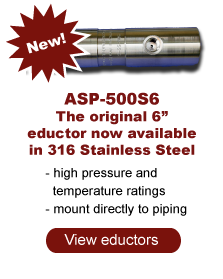 For the more challenging applications when high flows and higher backpressures are demanded, the Hi-Flow mini-eductor (ASP-520R-x-x), designed specifically for this purpose, is required. Illustrated below is the performance curve for elevated back pressure over a range of motive pressures for this model. This curve shows the conditions to generate 1 SLPM sample flow. If a greater flow rate is required, e.g. for an analyzer shed vent header that must be sent to a flare, the ASP-520R can easily meet these challenging conditions. For many applications with a backpressure at the discharge, the requirements are not as stringent. Below are curves generated for the standard ASP-520-x-4 and ASP-500T6 series of eductors at different elevated exhaust pressures. As has been illustrated above our eductors fit a wide variation in conditions and requirements. Let us know what your needs are.